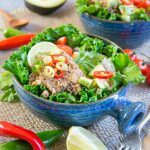 This tasty vegan burrito bowl with refried beans, rice, avocado and kale leaves has a spicy cumin kick. Delicious, vegan, and filling; the perfect comfort food. Bowl food is a lot more than just an Instagram hashtag. I love relaxing on the sofa in front of the television, bingeing on a box set while eating a healthy, easily prepared bowl. 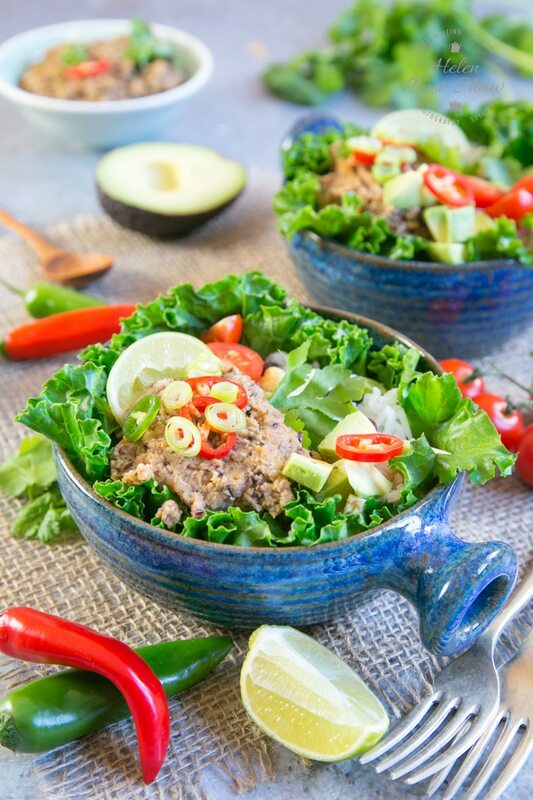 This vegan burrito bowl recipe is a perfect example; simple and quick to make, delicious, and perfect as an all in one meal. 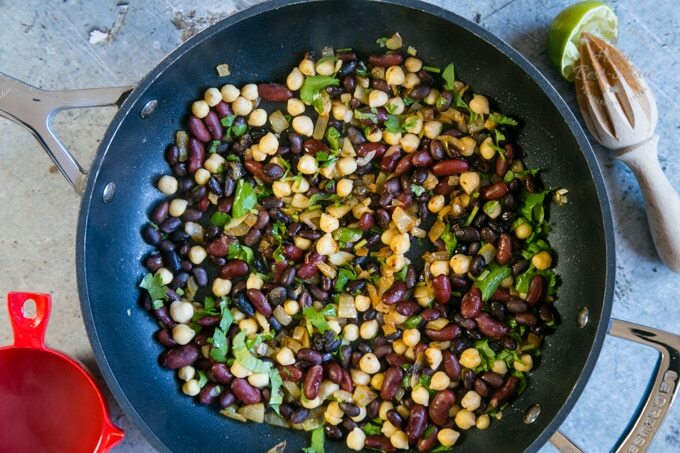 I made this bowl using the Mexican Bean Mix from the Birds Eye Pulses range, which contains a mix of frozen chickpeas, kidney and black beans. There are two other varieties available: Chickpea & Spinach, and Italian 3 Bean Mix. 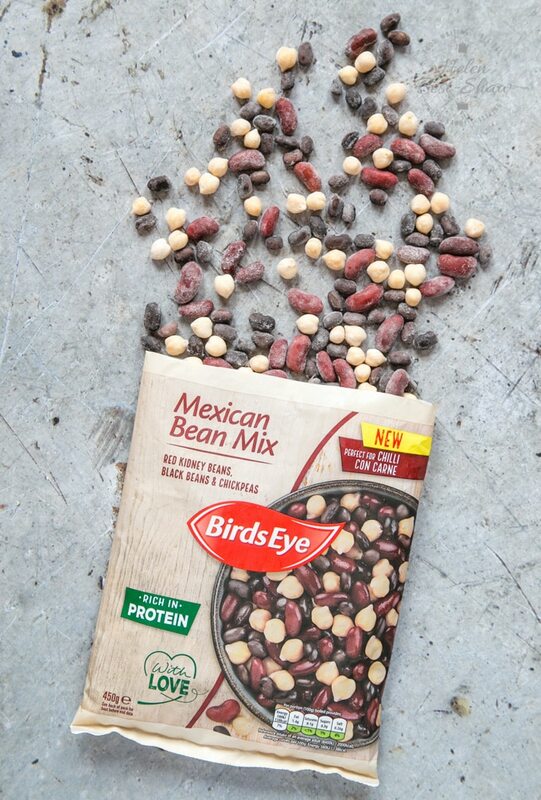 The great advantage of using frozen pulses, like these Birds Eye mixes, is the time and convenience over dried pulses. No soaking for hours then cooking, and unlike tins, you don’t have to drain and rinse the beans, and then be stuck with the leftovers when I use only half a tin’s worth. Cooking from frozen means that I can use the exact quantity I want poured straight from the packet, and they take only a few minutes to cook. Freezing locks in the flavour so I find that these mixtures taste really vibrant and fresh. 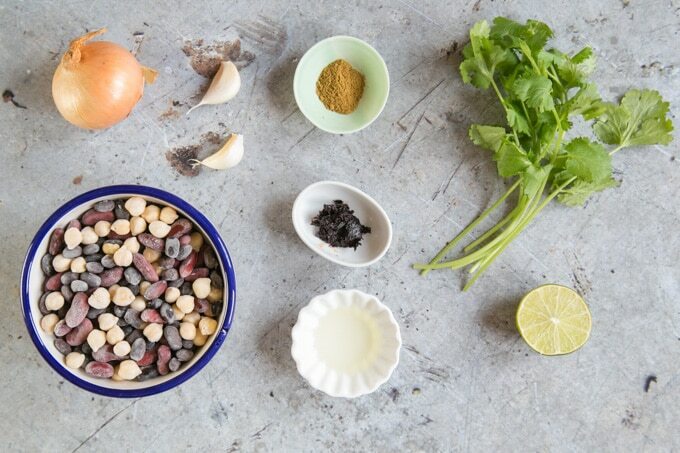 The Italian mixture includes frozen green beans, and the chickpea and spinach mixture has cauliflower and lentils, making for no-hassle help on the way to my five a day. The mixtures can be cooked with water in a saucepan on the stovetop, but I find the easiest thing to do is to steam them in the microwave in a covered pot with a little water. Cooking with Birds Eye Pulses also frees up time spent on food preparation, which gives me more time to get creative in the kitchen and experiment with different autumnal flavours. 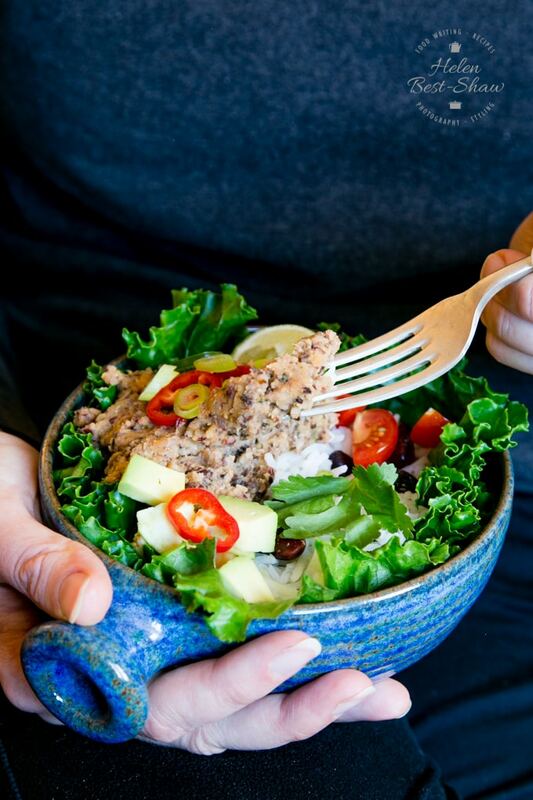 For more ideas for tasty bowl food, follow the hashtag #Goodforyourbowl. 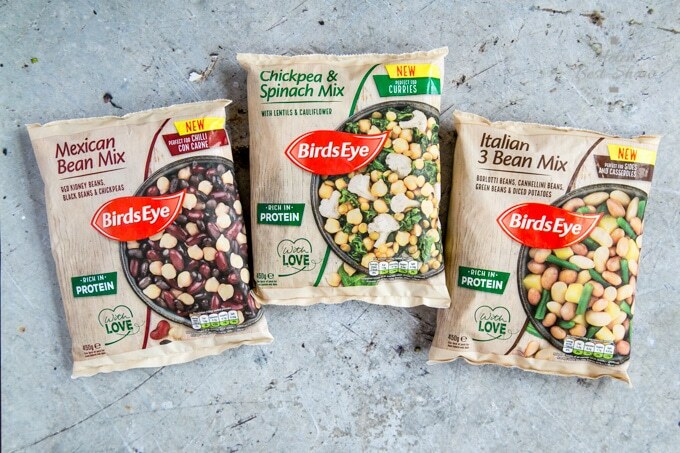 Birds Eye Pulses are available from the freezer department in larger Tesco, Asda stores and online from Ocado for £2.00 per 450g packet. I’m always looking for ways to boost the amount of vegetables that I’m eating, and I’m fully signed up to the meat-free Monday concept. A dish like this is perfect: not taking long to make, delicious and filling and 100% meat free. They’re only fried once, so why are the called refried beans rather than just fried beans? It’s actually a mistranslation. The Mexican name of frijoles refritos means “well-fried” or “well-cooked” beans. Step One – measure out your ingredients. 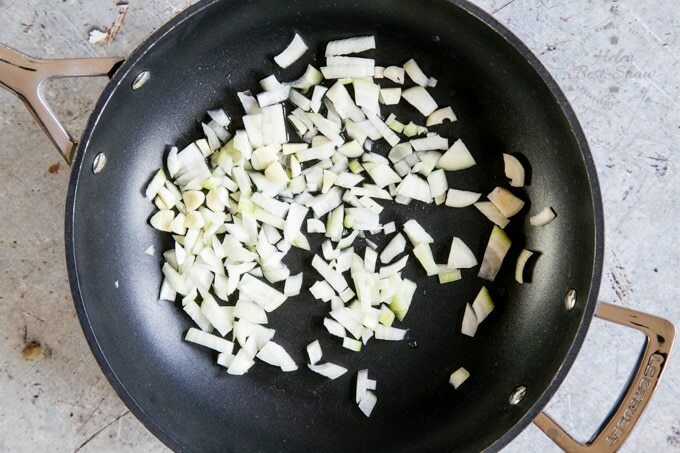 Step Two – chop the onion and fry in a large frying pan with a tablespoon of oil. Cook the onion over a medium heat. When the onion has just started to become translucent, add the garlic and cook for a couple more minutes. Step Three – add the cumin. 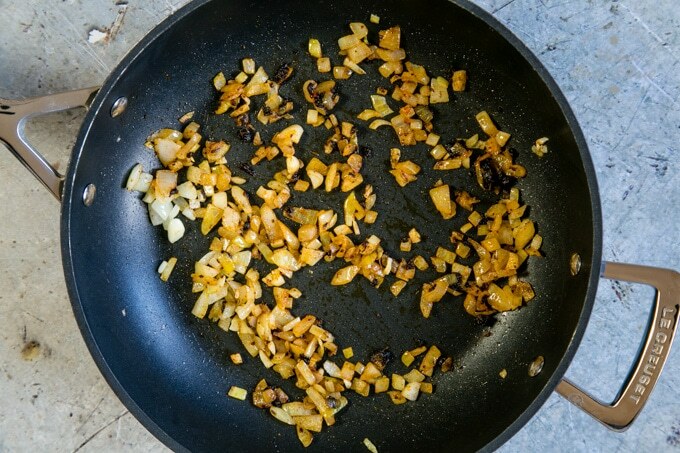 Step Four – Stir in the cumin so that the onion is evenly coated. Cook for a few more minutes so that the delicious spicy aromas are released. At the same time, cook the beans; either steam in the microwave or cook in a saucepan on the stove top. The beans should be cooked until soft – this may make take a little longer than the packet instructions. Keep back about half a cup of the cooking water. 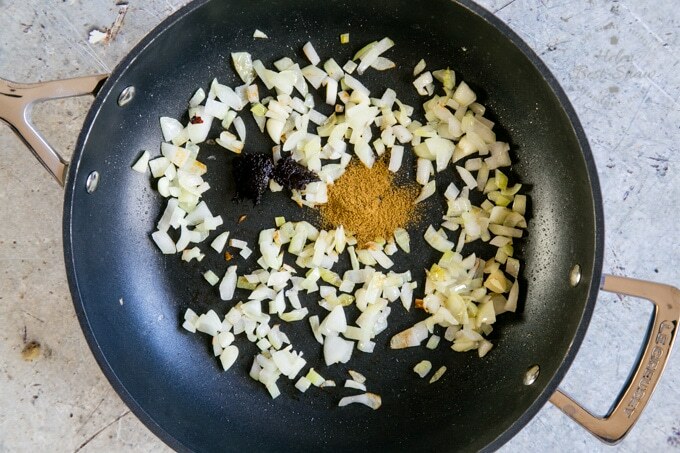 Step Five – add the cooked beans to the onion, spices and garlic. Add chopped coriander and lime juice. Step Six – cook the beans until soft. Step Seven – mash with a potato masher into a coarse, textured puree. You can also use a stick blender. If you need to you can add some the cooking water you kept back at the start to loosen the mixture. Cook the rice according to your favourite method. I’m a big fan of cooking it in the microwave. Lightly cook some kale leaves. Assemble the vegan burrito bowls. Line each bowl with the kale leaves. Add rice, and top with refried beans. Garnish with cubes of avocado, slices of jalapeño peppers, and a quartered lime. 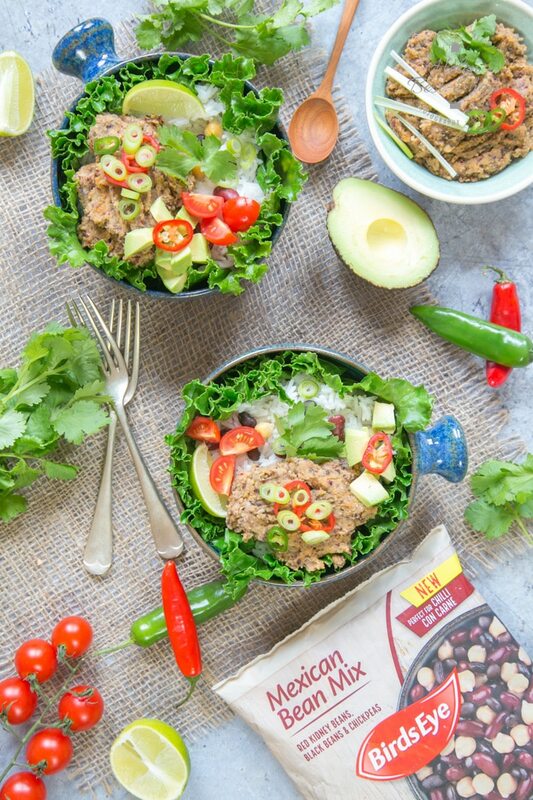 If you try this Vegan Burrito Bowl Recipe with Refried Beans please tag #FussFreeFlavours on Instagram or Twitter. It is amazing for me when for me when you make one of my recipes and I really do love to see them. You can also share it on my Facebook page. Please pin this recipe to Pinterest too! Thanks for reading Fuss Free Flavours! Refried beans are rich, filling, and the centrepiece of this simple bowl. Add rice and lightly steamed kale for a delicious fully contained meal. Spice up the dish with slices of jalapeño peppers and lime juice. If using frozen beans, cook in a microwave according to the instructions on the packet. Reserve the water used for steaming. If using tinned beans, drain the beans, keeping back half a cup of the liquid. Then rinse well in a sieve under running tapwater. Heat the oil in a large frying pan over a medium ring. Fry the onion until it starts to turn translucent. Add the garlic and fry for about two more minutes. Add the beans and cook until soft. Add half the coriander and the lime juice. Mash the beans with a potato masher until they reach the desired consistency. You can also use a stick blender. If needed, to loosen the mixture, add the cooking water that was kept back in stage one. I prefer some texture, and not mashing the beans until they're too smooth. Add the remaining coriander leaves, check the seasoning and add more lime juice if wanted. 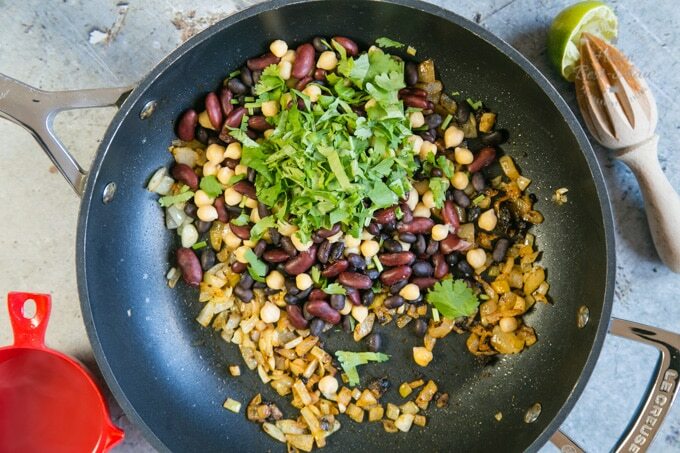 To make vegan burrito bowls. Cook the rice using to your favourite method and the instructions on the packet. I am a big fan of microwaving rice - quick, simple and fuss free. 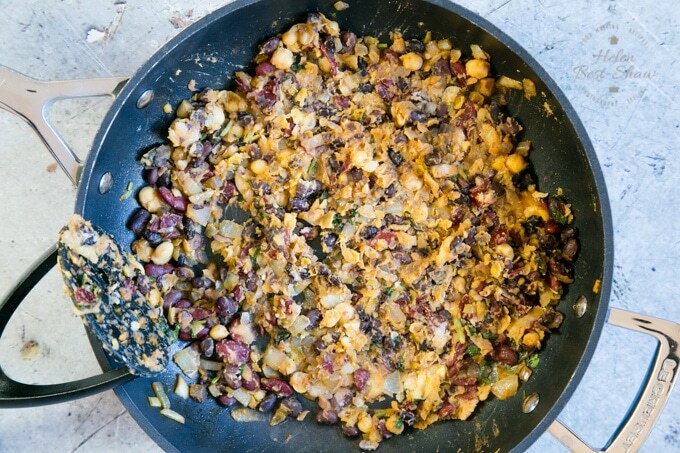 Assemble the dish: line the bowl with the kale, add rice and refried beans to the middle of the bowl. Top with cubed avocado, sliced jalapeño and serve with a quarter of lime.